Need new toys for your little one? Interested in toys that combine fun while enhancing your baby’s learning? For the best educational toys for baby, look no further. While they might not have the ability to build robots from day one, most babies start their learning process from the first breath. New skills are acquired and important milestones are being reached during the first year of a baby’s life. Educational toys can be of great help to develop new competencies. Selecting educational toys adapted to your baby’s abilities should support your child’s brain development. Before reviewing the best educational toys for baby, let’s discuss which important skills babies can acquire through play. Use the links above to check the latest prices or read our in-depth educational baby toy reviews below. What Skills Can Educational Toys Develop? From birth, babies begin their learning process in four main areas. Through cognitive development, infants start exploring their surroundings using their small hands and wide opened eyes. Even at this age, toys can teach your child to gather information and solve problems. Babies also learn social development and how to begin interacting with people. 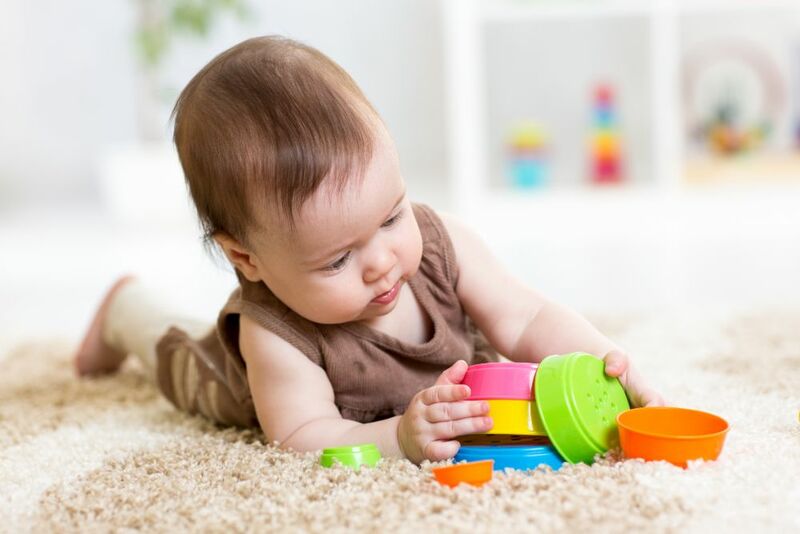 Infants from 0-3 months mainly learn by observing their environment. Beyond 2 months, some babies can start interacting through smiles, while at 9 months or earlier, baby can wave goodbye (source). In America, it’s estimated that 40 percent of babies lack a special bond with their caregivers. This necessary bond can be created through toys and play (source). 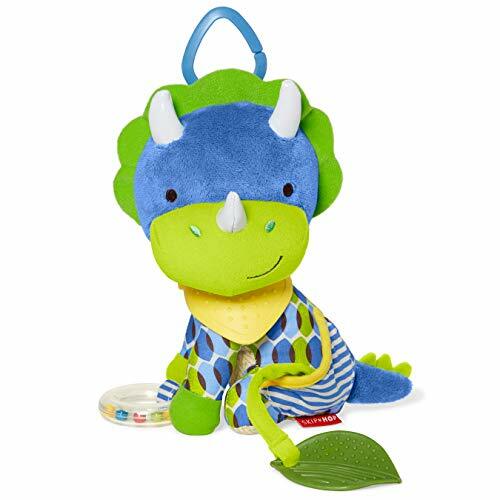 Toys encouraging speech and language development can help babies to learn their first few words. Finally, motor skills are also being acquired during these first months. Smaller muscles — such as those in the fingers — are being used to grab things, turn pages, or hold a baby bottle. As your baby grows, they’ll learn to use bigger muscles to sit, crawl, walk, and even run. Selecting toys that encourage your child’s brain development can play an important role in early life. Selecting the best educational toys for babies doesn’t only rely on the skills they could develop. Other factors might be worth considering. Small pieces are most parents’ worst nightmare. Low-quality toys can potentially be dangerous. If small parts come off — eyes, buttons, small plastic pieces — they can easily be swallowed, endangering your little one’s safety. Prevent catastrophe by ensuring that the toy only contains pieces bigger than your baby’s mouth. If any piece can fit inside the middle cardboard cylinder of a toilet roll, it’s usually not safe (source). To avoid injury, good educational toys should also have a rounded shape, or at least no sharp edges. For small babies, lightweight toys are more suitable. Remember, what’s considered light for you might not seem light for your baby. Also, if your child drops the toy, they’re less likely to hurt themselves with a lighter toy. We don’t always realize the danger a simple cord longer than 12 inches can represent. Toys with long strings can become entangled around your baby’s neck, potentially choking them. Cut these off if they’re not needed, or at least knot them, to eliminate the risk. These days, reading labels and product descriptions is essential. To make toys cheaper or more durable, harmful chemicals can be added, such as phthalates or BPA. Heavy metals — mercury, lead, cadmium, or arsenic — can still be found, even in popular toys (source). Now that we understand how educational toys can be used, and what to look for, I’ve put together my selection of the best baby toys. 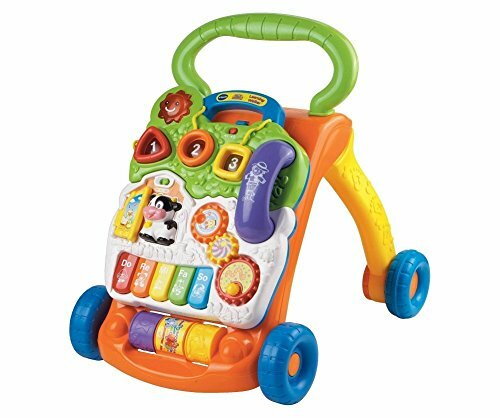 This learning walker seems to be one of the most popular toys for babies aged 9 months and older. This multi-purpose toy teaches your child how to identify shapes, sounds, animals, and numbers. It can be used from either a seated position or while standing. The front board can be easily detached and placed on the floor. For older babies, the walker can be pushed from the back, to help your child make those first steps and gain confidence. Beyond developing motor skills, a pretend phone allows imaginative and pretend play, to imitate mom and dad. 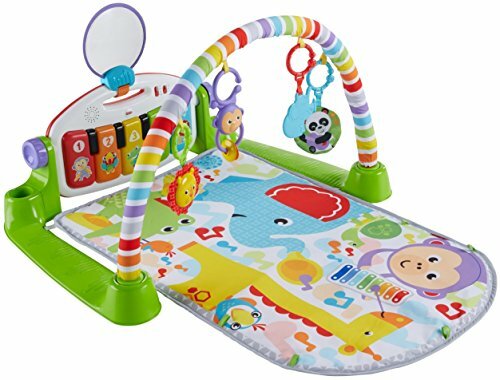 This activity table is suitable for all babies older than 6 months. It can be set up in English, Spanish, or French, introducing your little one to new languages. Language learning seems to be easier for kids, so why not take advantage of it? It also features a piano, drum, French horn, and a guitar, to develop your child’s musical skills. Through play, this toy teaches your child shapes, colors, and numbers from one to five. If your baby isn’t old enough to stand and play, the board can also be detached and placed on the floor. These stack-up cups might appear to be too simplistic, or boring to most adults. This classic toy is, however, a widely popular choice. With holes in the bottom of each cup, they could even be used in the bathtub. 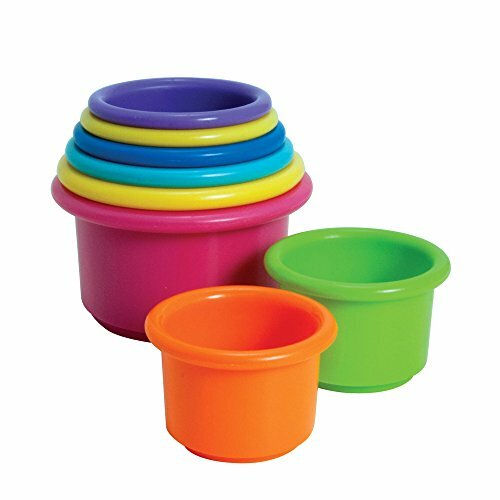 Easy on the pocket, the set comes with eight brightly-colored cups that your baby will enjoy piling up. The colorful cups aren’t only teaching colors and stacking skills, they’re also numbered, familiarizing your child with basic counting. They’re sturdy and non-toxic — BPA-, phthalate- and lead-free — this material will resist most kids’ throwing skills. 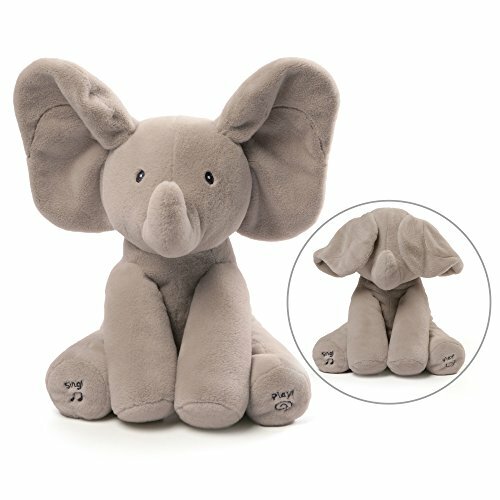 This cute animated elephant toy is a lovely, cuddly option, suitable from birth. Through sounds, music, and play, it’s designed to develop social skills. Easy to use, a single press on either foot starts a song or a peek-a-boo game. The automated ears that flap should entertain your child for some time and this elephant might quickly become your baby’s first best friend. Concerned about safety for your newborn? This toy is made of high-quality material. No hard plastic or glass is used; instead, details are embroidered. Is your baby enjoying music and sounds, but you don’t have space for a large musical table? Maybe you need something that can easily be carried around. 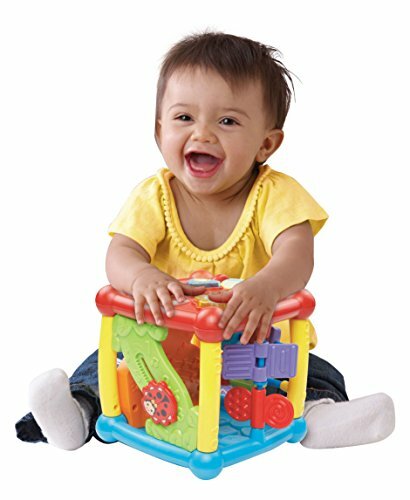 This musical toy is ideal for babies older than 3 months. 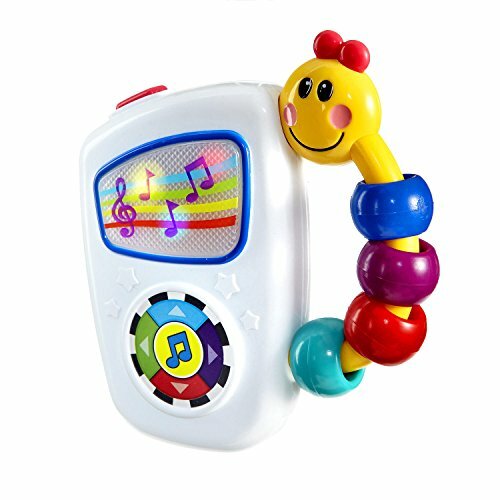 It features lights and seven different melodies, with large buttons so that your baby’s small fingers can effortlessly switch from one to another. It’s designed to be easy to grab and hold in the smallest hands. Although young babies don’t have much mobility, their brains double in size within the first year (source). Stimulating your child’s brain through simple toys and music has a great impact on development. This “Bandana Buddy” raccoon contains 10 activities designed to awaken your infant’s senses. It’s made of several patterns and textures, and a rattle ring produces different sounds. The kid-friendly mirror will be a big hit. Hung on a crib at home, or attached to your stroller or car seat, this teething toy can follow your child anywhere. Not a big fan of the raccoon design? This toy also comes in a lion or elephant shape, among others. Concerned about quality? This toy doesn’t contain PVC or phthalates. Babies under 6 months can be placed lying down over the colorful and fun, machine-washable play mat. On their back, they can access a complete toy arch, with hanging toys that can be repositioned, including a rattle and teether. The mirror should also keep your baby intrigued for a while. As your child grows, they can sit on the mat, reaching more activities independently. This set can help your kid develop their senses through sounds, songs, and even a piano. When your child starts walking, the piano can be detached and carried around. This toy set is easy to assemble and disassemble for transportation. This cloth book, featuring multiple textures, was conceived to stimulate your child through every page. The love for reading usually starts at a young age and this habit may follow your child for their lifetime. Bedtime stories don’t only create a special bond between parent and child, it’s also an important learning time, where your kid expands their horizons. The soft cloth pages are safe for babies of all ages, and a teether bit is included. 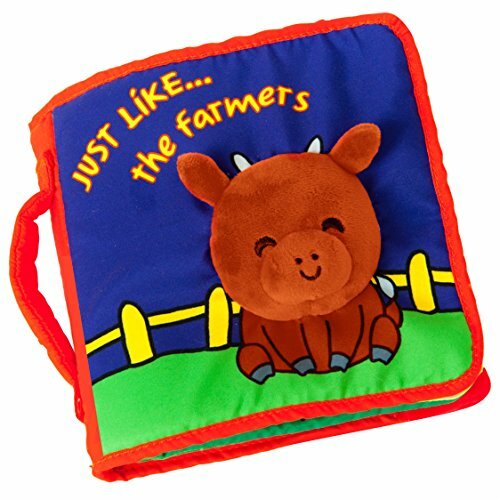 Made of polyester, this non-toxic cloth book is also durable and washable. The special hook makes it easily attachable for a stroller or car seat. Are you looking for an educational book that’s slightly more interactive, to keep your little one engaged and excited? This book is suitable for babies from 6 months old. 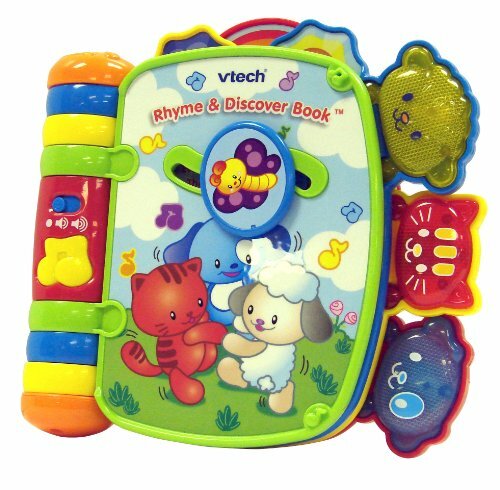 To introduce your baby to the world of reading, this book includes character buttons and movable pieces. Easy to turn with small fingers, the book’s pages feature several nursery rhymes, activated by special buttons. It’s aimed to stimulate your little one’s brain and, if no activity is detected within eight seconds, the book starts talking, encouraging your child to keep playing. This 6-12 months baby toy will help your child develop motor skills, such as squeezing and piling up colorful cubes. 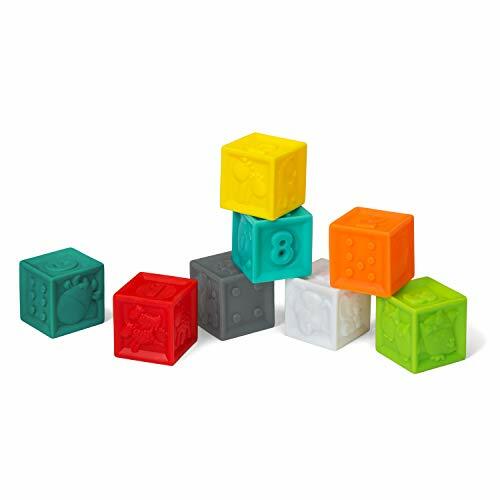 Identifying colors, animals, shapes, and numbers is another important learning aspect of this 8-piece block set. At this age, most babies enjoy throwing anything in their possession. Because they’re made of rubber material, they’re soft and unlikely to hurt your child — or your furniture. They’re also BPA-free and don’t contain any phthalates, lead, or latex. Although young babies aren’t able to communicate effectively yet, they usually have a great time observing what’s happening around them. This is an important part of their cognitive development. The two attached toys should keep your child busy. 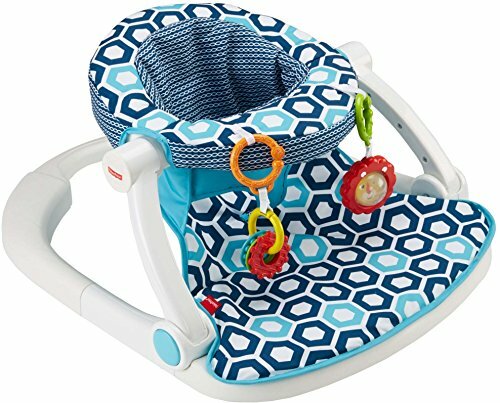 While sitting comfortably, this observatory seat allows your baby to keep an eye on everyone and everything. The back is high enough to provide good head support for smaller babies, who aren’t yet able to sit unaided. Wide and stable, the seat is able to withstand the most lively babies, up to 25 pounds. The seat pad can also be removed and washed when needed. To store or carry around, it can easily be folded flat. 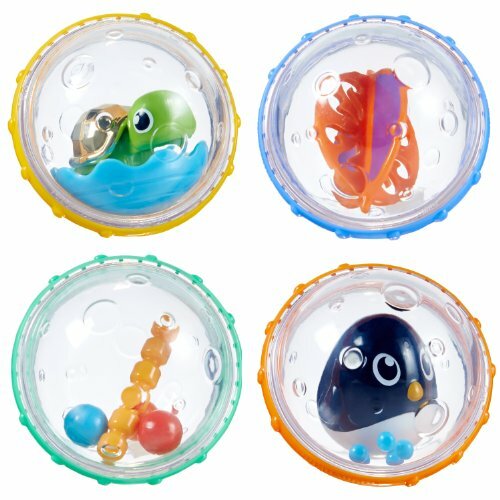 Suitable for water-loving babies, this toy can make bath time fun and educational. The set includes four floating bubbles with small toys, rattles, and cute animals inside. Each bubble is designed to fit in a baby’s hand, as they push, throw and shake them, developing their motor skills. They’ve been designed to also improve your baby’s sense of touch, sight, and hearing. If your baby wants to play with them more often, they can be used outside the bathtub. When bath time is over, the bubbles will dry fast and without the risk of harboring mold. Containing over 45 different songs, this trendy remote control should keep most babies occupied for some time. Babies love pretending, and this toy, for age 6 months and up, will help develop their imagination and fine motor skills. Large and easy to use buttons — including weather and news — emit lights when pushed. At every press, a click sound can be heard, to let your child know that the switch is effective. The buttons also introduce your little one to shapes, colors, and numbers. And to make mom happy, this remote comes with volume control. With every side of this activity cube is a fun and interactive tactile game, helping your baby’s journey of discovery. Your child will be introduced to the animal kingdom, through buttons showcasing the animal name, its sound, and shape. You’ll also be able to teach your child musical sounds through the instrument button. 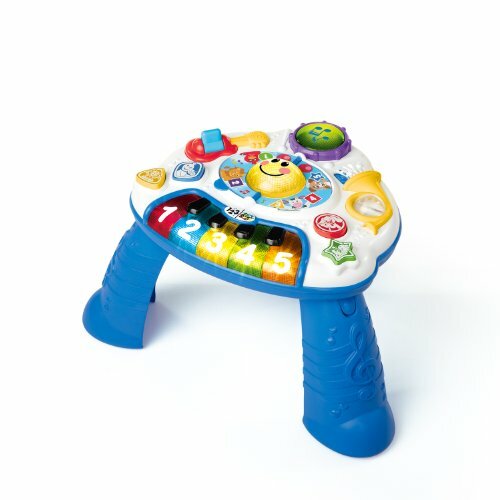 Sliding and spinning game sections will tune your baby’s fine motor skills. Free of BPA, this toy is safe to use. Not only does it come with volume control for parents to use, but it will also turn off automatically after a while. With a variety of textures, shapes, and tasks, this group of rattles was specifically made to entertain and help your baby develop cognitive and motor skills. Although they may look like simple tools to keep your baby busy, there’s more here than meets the eye. The set includes 10 rattles, some of them also serving as teethers. Using different grip methods, it will expand your little one’s finger, hand, and wrist dexterity, and coordination skills. This will be great fun, for a tiny tot up to a 1-year-old. As babies grow, they often create an emotional bond with objects or people. 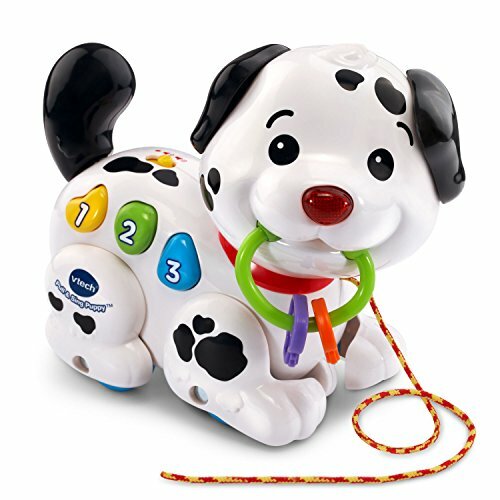 This adorable puppy helps your baby develop fine motor skills, and will quickly become their best friend. His flashing nose and the colorful buttons located on his tummy will be a great attraction. As your child gets older, they’ll understand what the puppy says and even pull him around on the leash. When not being used, the leash should be removed for safety. For complete fun, and a more realistic look, the puppy’s legs and ears are movable — a great companion indeed. 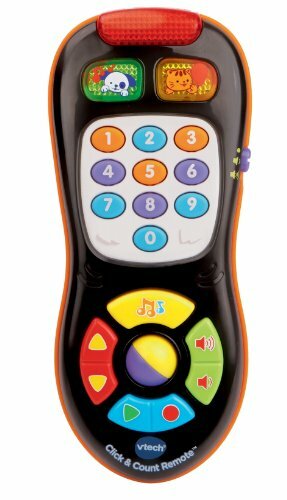 For parents, this toy is made of durable material and comes with volume control for quiet play times, and an automatic shut-off mode. Are you renovating your home, or is daddy a gifted DIYer? This interactive Fisher-Price workbench has everything needed to help dad in his building activities. While playing, it also improves your baby’s dexterity, hearing, and motor skills. Your little one will drill, spin, pound, slide, and paint, while learning letters, numbers, shapes, and colors. 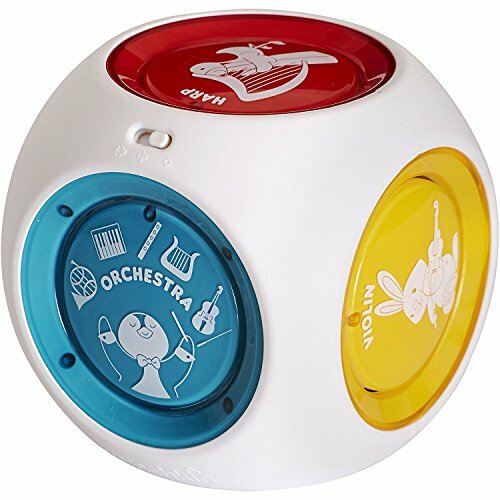 This set even includes 15 pieces of music, to set the rhythm and develop your kid’s musical tastes. Needless to say, this toy should last your baby well into toddlerhood, thanks to the Fisher-Price durability and quality. 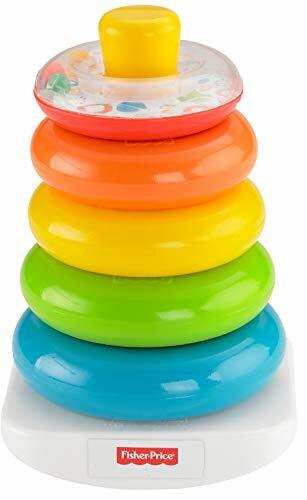 Never going out of style, this stacking toy is best suited for babies over 6 months old. 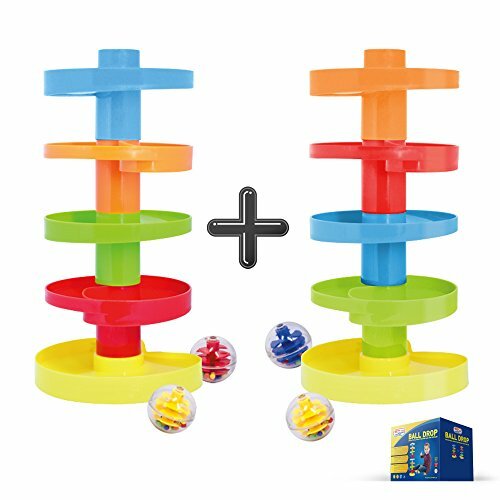 It’s a classic and popular option that has been around for decades, entertaining and helping babies discover stacking, relative sizing, and more. 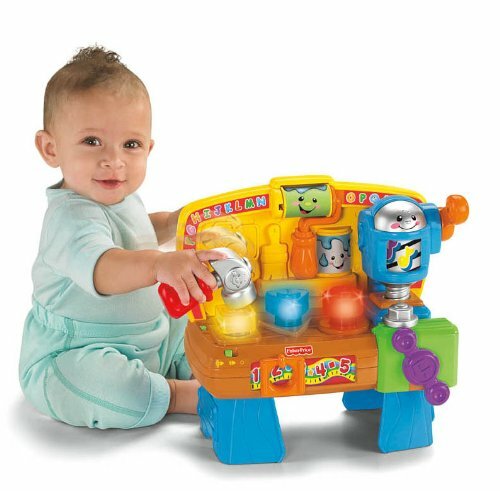 This toy teaches your child some basic colors as well — green, yellow, red, blue, and orange — while enhancing motor skills. The top ring includes some rattly beads on the inside as well. 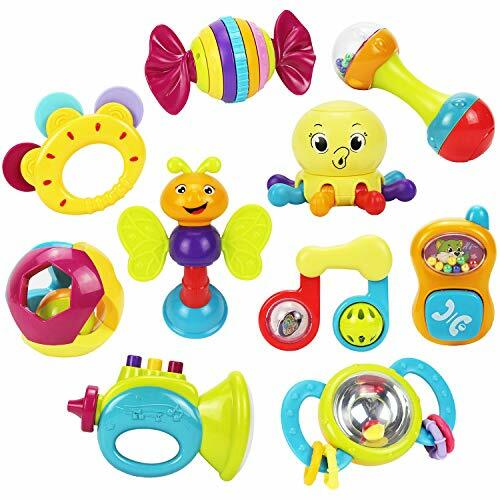 For young babies, the rings might become teethers and chewing instruments. Luckily, this toy is safe and made of durable material that should withstand the test of time. The rings are also easy to wipe clean, but shouldn’t be immersed in water, as it may find its way inside. This toy won’t only be entertainment for your baby — the entire family could play along! Colorful swirls stack up to form a 9-floor tower, with four balls that race down the ramps. For added fun, each ball makes a sound as it rolls down. 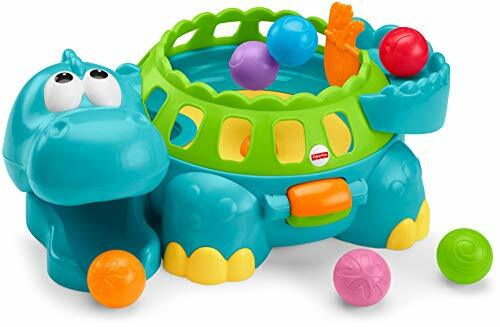 This might be one of the first construction toys your child owns and is a great introduction and transition to toddler toys. If nine floors aren’t high enough, additional sets can be purchased to increase the tower’s height. 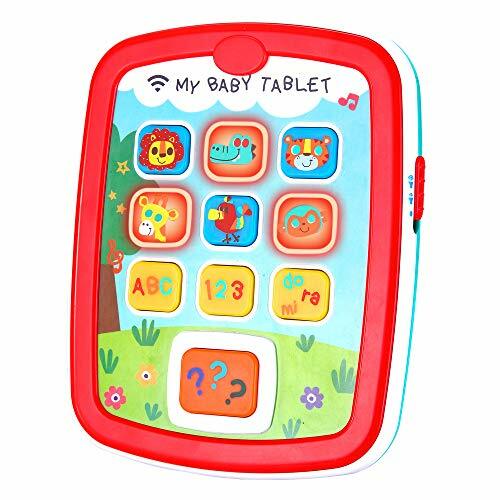 For tech-savvy parents, this baby tablet is designed to stimulate all the senses for children aged 6 months and older. It comes with 10 large buttons, which can easily be pressed by small baby fingers. When buttons are pressed, the talking tablet teaches your child about animals, letters, and more. Lights, melodies, and sounds add an extra layer of stimulation to keep your baby engaged throughout the learning process. The rounded edges make this toy safe to use for the youngest ones, and the tablet’s size is suitable for little hands to hold. Not all sounds are created equal. Some baby toys — such as this magic cube — can also produce amazing melodies. It introduces your baby to the magic of classical music and sounds, including eight Mozart compositions. It includes the sounds of piano, violin, horn, and harp, and the “orchestra” button will allow all instruments to be played together. The brightly-colored buttons are large and easy to press, even for the youngest ones. As a bonus, they also emit lights. It’s widespread knowledge that classical music is great for our brains, so why not start them young? Trying to encourage your baby to crawl? From the first ball dropped in the dinosaur’s back, this toy guarantees happy screams of excitement. Then your little one is off to fetch them once they’re popped out again, with tunes and sounds to accompany them. As your child goes after the colorful balls, this makes a great time for teaching colors, improving gross motor skills, and hand-eye coordination. Not to mention the physical exercise they get. Oh, car rides with babies… parents will do anything to keep their kids entertained during travels. This toy might just be what you’re looking for. Playing, pulling, and kicking this toy won’t just keep your child busy, but tune their fine motor skills, too. Learning happens even when you’re on the go. 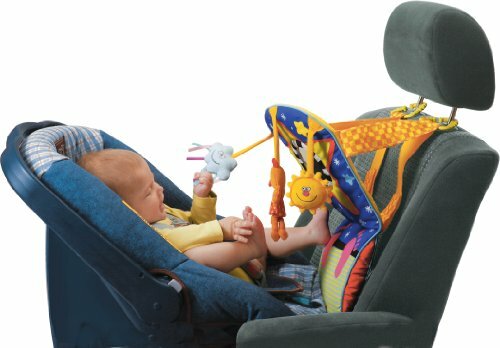 The straps are adjustable to fit any car headrest, change the angle and height to ensure that it’s not blocking your view of the baby. Your child should be able to reach each hanging toy easily, without your intervention. The toys emit gentle sounds and music to kick up the fun. The central mirror won’t only keep your baby intrigued, but it also helps you to keep an eye on your baby through your rearview mirror. Selecting the best educational toy for your baby can be overwhelming when so many options are available. I hope this guide has helped you make a choice. Whether you’re looking to refine their motor skills or encourage them to crawl, there’s something for everyone in our list. I personally lean toward multi-purpose toys lasting through different ages. The Sit-to-Stand learning walker would certainly be my go-to for this reason. Which educational toys have you already purchased and what was your opinion of them? Please leave a comment in the section below, we’d love to hear from you.